One of the things I love about flowing water is that it is so scalable - a little stream flowing through sand acts the exact same way a huge river does in the same circumstances. I just happened across some really neat looking stream tables at this website. These could be a great outreach tool. Granted, as a graduate student I can't afford to buy one of these, but maybe some day I can get one or make one on my own. Ask Me About This Watershed! As mentioned in a previous post, I thought it might be fun to walk around Schenley Park and adjacent areas in a shirt that says 'Ask Me About This Watershed!' and see if anyone actually asked me. So... I did it! In The Watershed, a great blog about a watershed in the Los Angeles area, just posted a link to a really neat atlas of Low Impact Development (LID) projects focusing on runoff/water management across the country. This project is being conducted by the National NEMO Network based out of the University of Connecticut. This is a great site and I am having a lot of fun scrolling around the map and looking at projects in different places. I immediately noticed that there are no projects from the Pittsburgh area on the map! Hopefully I can help to remedy this soon! If anyone else knows of similar sites, or of additional blogs I should link to, definitely let me know! It isn't really possible to fully understand an urban watershed without knowing what the natural and rural context or this area is and was. Last month I went to McConnells Mill State Park. Although beautiful, that area, with its history of glaciation and slightly higher/more northern location, was not all that similar to Schenley Park. In fact, with the presence of white pine, yellow birch and copious beech and hemlock, it reminded me more of Vermont than Pittsburgh. Last week I went to Cedar Creek Park, which is a bit less wild and remote, but a bit more similar to the forests currently and historically found near Pittsburgh. I also drove home along the Monongahela River. Last night a very impressive line of thunderstorms formed in northern Ohio and Pennsylvania. 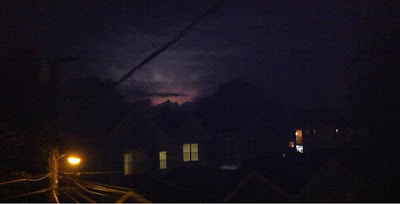 There was some very impressive and beautiful lightning in Pittsburgh's northern sky, flashing through much of the extraordinarily hot night. Tonight there is a similar line of storms, only a bit closer and a bit faster moving. There is again lightning to the north, though less impressive at the moment. Perhaps I will still be able to take a few more pictures. In any event, I sure hope this time the rain makes it here. It's been dry and hot, and some rain sure would be nice. The storm currently has 60 mile per hour winds in it, though, so watch out if you're outside tonight. 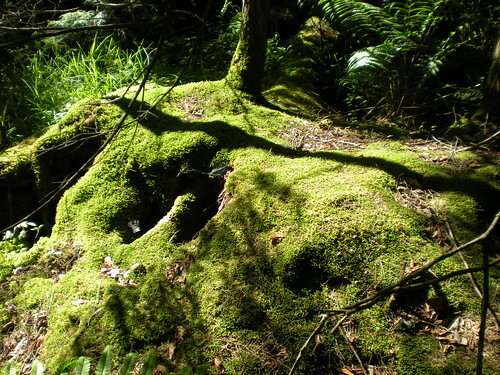 My next post will be about an explore of the 'Middle Mon Valley', hopefully tomorrow. I was walking through CMU the other day, one of the recent days where thunderstorms were building but no rain had yet fallen. Yet, despite the lack of rain, I came across an area of water dripping off the Fine Arts Building. In yesterday night's blog entry I mentioned some Pale Touch-me-not that was wilted, and speculated that it could be due to the hot, relatively rain-free conditions. I was exploring Cedar Creek Park (near Donora) today and saw something that makes me think that the plants 'wilt' due to heat or direct sunlight but not due to lack of water. I found a plant that was half in the sun and half in the shade. The sunny side (on the right) had 'wilted' curled up leaves and the shady side (on the left) did not! Since the plant gets all its water from the same root system (and also because it had recently rained in that area), it is very unlikely that the plant was wilting on only one side due to lack of water. Instead, it is probably curling its leaves to reduce the effects of heat and sunlight. There were many other plants in direct sun, which were also 'wilty', and in shade, which were not. I'll have more thoughts on my visit to Cedar Creek Park soon! Earlier this week I was in Panther Hollow on a warm, sunny afternoon. It hadn't rained substantially in a few days and it really showed. "Ask Me About Your Watershed" Project? After wandering around Schenley Park a bunch of times and almost always getting into interesting conversations with random people, I thought it might be fun to initiate a mini-project where I encourage people to talk to me. While I am not particularly shy, it is often difficult to initiate conversations with random people, especially in urban settings (in rural Vermont it would often be rude NOT to!). Anyway, my idea was to make some sort of sign, or even a shirt (probably a blank white one drawn on with sharpie), to wear when i am wandering around the 4 mile run watershed. At best, it might encourage some great conversation and at worst, people will ignore me and I can go poke around in the creek. Although ecologically- and socially- conscious watershed and runoff management are relevant everywhere, the methods through which one achieves these goals will vary greatly in areas of different climate and geography. Southern California, where I grew up, has turned its backs on its rivers to an extent I haven't encountered anywhere else. 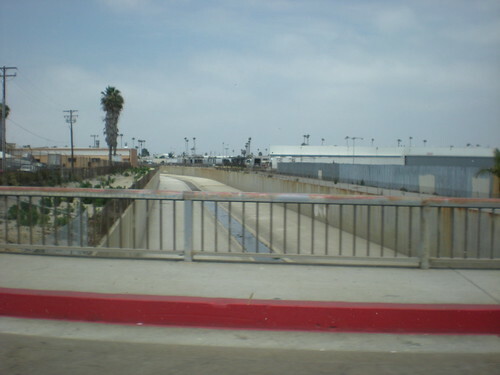 While the rivers in Pittsburgh struggle with pollution and access issues, many rivers in the Los Angeles area - even the mainstem channels - just don't exist as rivers anymore, but are instead routed into giant gutters like this one I posted last week. The sprawling nature of cities in Southern California may offer many opportunities for small-scale stormwater management solutions such as rain gardens. However, this same sprawl has eaten away at almost all of the space that could be used to restore or daylight rivers without ensuing immense costs. Interestingly, as in Pittsburgh, Los Angeles has a lot of railroad infrastructure along it's main river(s). These people have created a proposal to build a large constructed wetland, park, and restored river section on a railroad yard. I think it's a great idea in theory, though I am skeptical that it would be possible to do this and still find enough space to operate a railway to truck transfer facility. Although rail yards are not particularly pleasant, and it is unfortunate that these facilities tend to be near watercourses, we also need space for infrastructure, and trains tend to be much more efficient in moving freight than trucks or airplanes. Then again, I don't want to naysay what could be a really neat project, so hopefully something is figured out. It's definitely something to keep an eye on if you have any interest in southern California or in urban river restoration. Is Panther Hollow Run a Beheaded Channel? The idea of a 'beheaded channel' sounds quite morbid. 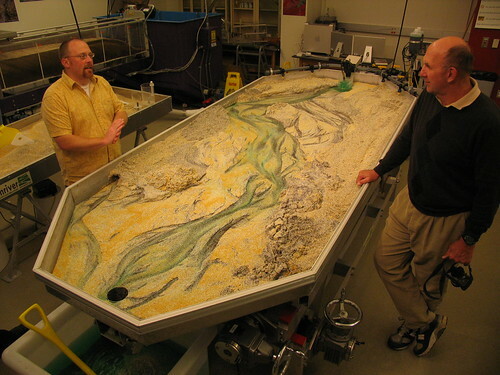 In fact, it is a term used by geologists to describe a natural process that can happen to some watercourses, such as creeks that flow across a fault. However, we have also 'beheaded' Pittsburgh's Panther Hollow Run when we routed runoff from Squirrel Hill into the sewer. Is this a good thing or a bad thing? In a sense, it is both. Slow Water Movement Facebook Page! 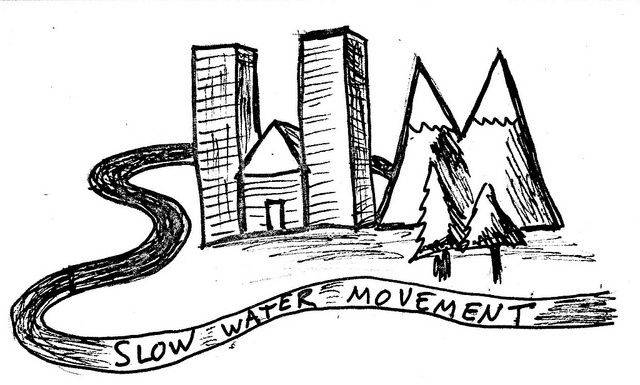 Update: You can now become a fan of the Slow Water Movement on Facebook! Has anyone wandered around on the Carnegie Mellon University campus and noticed that the tennis courts are located in a 'pit' (one T!) in the middle of campus? There is another such formation just to the east as well. These 'pits' are in fact remnants of a historic gulch that once cut through the area where CMU is now present. I wanted to post a link to a new message board set up by the Pittsburgh Parks Conservancy. This message board is a place for community members and interested individuals to discuss issues relating to Pittsburgh parks. Click on the Schenley Park message board and you will find a thread about my project and this blog. There are also public message boards fro other parks in Pittsburgh. If anyone would like to discuss the parks in a more convenient setting than the 'comments' section of this blog, check that site out. I will be regularly checking on it, as will employees of the Pittsburgh Parks Conservancy and other community members. If you live in or care about Pittsburgh you should use the site too! Slow Water? or No Water? I was in the Los Angeles area the last few days visiting family. While I was driving near downtown Los Angeles, I saw something that surprised me very much - rain droplets on my windshield! If you aren't from California, you might wonder why this surprised me. The area is mostly urbanized, as was the case in Squirrel Hill, but I found a few fragments of urban nature, and some neat neighborhoods. Click below to see more. So, anyone in Pittsburgh or nearby areas has noticed by now that it is HOT out! Temperatures have been reaching the 90s for the last couple of days and probably will continue to do so for the next couple of days. This temperature map from the National Weather Service has perhaps poorly chosen colors (that yellow doesn't look so bad!) but you can see from the temperature readings that it is expected to be uniformly hot throughout the region. This may seem nasty but believe it or not it is actually hotter and more humid in parts of Vermont than in Pittsburgh. This is where the second half of 'slow water' kicks in. I've talked a bit in this blog about the benefits of creating wetlands, including water filtration and retention, wildlife/game species habitat, and recreational and aesthetic values. One thing that is very important to remember, however, is that there are lots of 'pre-made' wetlands already in place. In this case, they were created by glaciers, erosion, sediment deposition, and buildup of dead plant material, over thousands of years. I am talking of course about natural wetlands, which are invaluable because they are much more diverse and stable than created wetlands, and also are great places to visit to get inspiration for created wetlands as well. Large numbers of natural wetlands have been destroyed (well over 90% of the original area covered in wetlands has been destroyed and converted to other land uses in some places) and it is very important to preserve - and to appreciate - intact natural wetlands, and to care for not only these wetlands but the areas that drain into them. Click below to see a photograph of some neat natural wetlands in Erie County. They are a bit different than the ones you would have seen in the site of Pittsburgh before it was built, because Erie County was affected by glaciers during the ice age and the soils, geology, and landforms are different there. The weather is also affected by nearby Lake Erie. However, this will still give you a view of what some sorts of natural wetlands in western Pennsylvania look like. Helping Clean Up the Gulf of Mexico while in Pittsburgh. The continuing Deepwater Horizon oil spill is big news right now - as it should be. This major oil spill has caused an incredible environmental and social catastrophe in the Gulf of Mexico, particularly in the Mississippi Delta area. This area has already been suffering a great deal of problems due to a variety of issues ranging from pollution to wetland loss and effects associated with Hurricane Katrina. A lot of people want to help out, and there are a few ways you can do that right from Pittsburgh (or anywhere else in the Mississippi River watershed ).